Samsung delivers its first Series 9 LCD display, a 27" screen with a 2560 x 1440 pixel resolution. The In-Plane Switching (IPS) panel uses new Plane Line Switching (PLS) technology with LED (LED) backlighting, and promises a brightness of 285 nits, 1000:1 contrast ratio (which can be boosted with the Mega Dynamic Contrast Ratio feature), 5ms response time, standby power consumption of 0.5W, and max power consumption of 63W. The display features a high-gloss black and metal-silver enclosure, with tilt and 100mm height-adjustable stand. Ports include dual-link DVI, HDMI, and a dual-port USB 2.0 hub, and the box includes a DVI cable, DisplayPort adapter cable, and a USB 2.0 cable. The screen is currently only available in a timed-exclusive deal at NewEgg for $1,199. As well as acting as a standard USB 2.0 hub, the monitor's USB circuitry hides another feature: Mobile High-Definition Link (MHL) support. Connected to an MHL-compatible smartphone, the monitor can charge the device while simultaneously transferring high-definition video and stereo audio for playback through the monitor's integral stereo speakers. 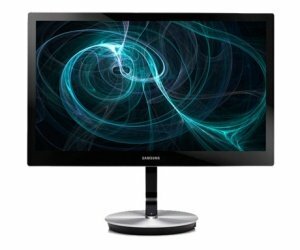 The display's biggest selling point, however, comes from a claimed hour-long adjustment process carried out at the factory during which Samsung engineers calibrate the monitor for maximum image quality. An in-built calibration engine allows for additional fine-tuning on-site, although the colourimeter sensor required is an additional-cost add-on. According to Samsung, the new PLS panel means improved colour reproduction across the entire sRGB spectrum with no degradation even when viewed at the extreme ends of the display's 178-degree viewing angle. The company is even going so far as to claim the panel offers the most accurate colour reproduction of any LCD on the market - although this claim has yet to be independently validated.